I just read about an ergonomic injury claim that spiraled out of control. In a nutshell, one employee changed another’s desk, chair and workstation setup, then that employee waited weeks for an ergonomist to revisit her desk and perform the adjustments for her. Since then, her existing injury, and the ongoing claim around it, exploded. The article didn’t share specific cost details, but from what I gathered, it had to be well over $100,000, perhaps hundreds of thousands. Last week, I spoke with a potential client whose company had experienced a dramatic spike in ergonomics-related injury claims over the past year, again resulting in 100’s of thousands of dollars in losses. It seems that some major changes on the company’s horizon were not sitting well with employees, contributing to an atmosphere of discontent. Are ergonomic injuries real, or are they conjured up by disgruntled, malcontent employees? There’s absolute, indisputable evidence that certain physical risk factors can and regularly do cause or contribute to discomfort, pain and injury. There’s also no doubt that some injury claims have their roots primarily in discontent. Well, we can dig our heels in and treat any and all such claims as suspect, and spend an enormous amount of time and resources in the fight to assign blame. Along this path, we’ll also paint the concept of ergonomics with a negative brush, throwing out the many other business benefits it brings. 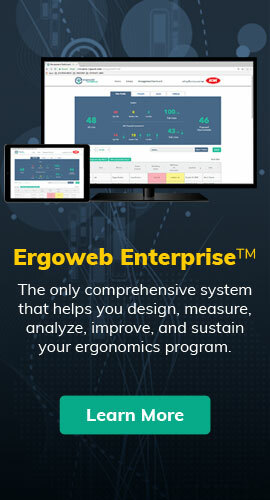 Or, we can recognize the complex nature of such injuries, then move on by building an ergonomics process that prevents true injuries from developing, properly manages those that may already exist, gently minimizes and manages questionable claims, provides a foundation for continuous improvement, and documents progress along the way. The later approach will also improve business metrics across the board, including productivity and quality, by better matching work requirements to employee capabilities. When done well, this process will also reduce absenteeism and turnover, improve engagement, moral and accountability. The “dig in your heels” approach will paralyze improvement progress, neglect the root causes of true injuries, and likely cost an enormous amount in wasted effort and resources. The winning party may have bragging rights, but really, everyone’s a loser in the end. A continuous improvement ergonomics process delivers clear, significant, measurable ROI. A dig-in-your-heels approach produces huge costs and enormous waste. Period. No ROI. I’m confident that had the employers mentioned above been using tools like JET™ and ErgoAdvocate® in their ergonomics process, they wouldn’t be experiencing “ergonomic injury claims gone wild.” Instead, they’d be on the path to operational excellence, optimizing human and organizational performance and well-being. Now that’s ergonomics.